I always intend to read those giant old classic books - I even download some of the free ones onto my Kobo. Then I never, ever read them. Turns out, I just want to be a person who has read classics, not a person who sits down and reads them when they could be reading a feminist essays or sci fi/fantasy novel aimed at teenagers. So from now on I'll just steal cartoonist John Atkinson's witty summaries and sound really really smart at parties. The key, I believe, is to wait for someone else to mention the book and then write it off with a biting summary. Other person: "I just started reading The Odyssey, it is captivating. I am brilliant for reading and enjoying it." Me: "Oh, that's just about war vet who takes forever to get home and then kills everyone. PTSD, much?" 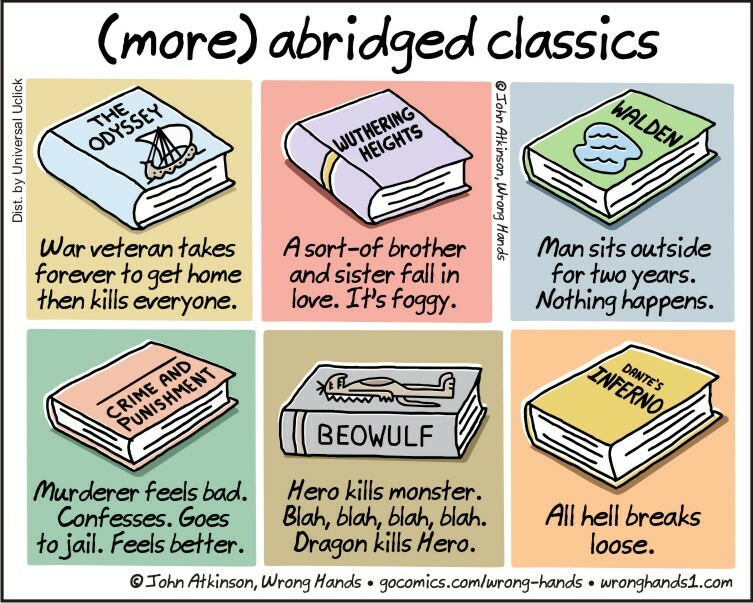 See more at John Atkinson's site Wrong Hands.